Aesthetic dentistry - Poncz Dental fogászati rendelő és precíziós szájsebészet. A snow white, sparkling, regular dentition is essential for a beautiful smile. In many cases professional tartar removal and tooth polishing done in our dental clinic provide eye-catching results. 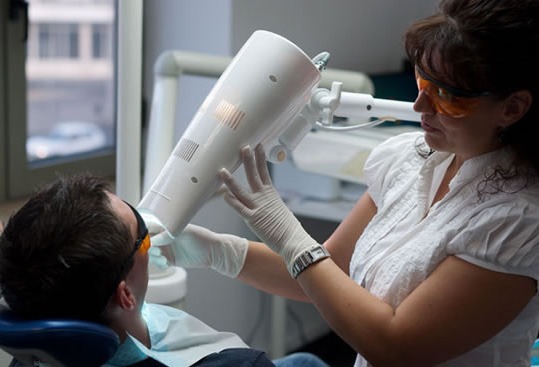 We use the „Beyond” bleaching lamp for tooth whitening. After tooth whitening with the Beyond System we can achieve an improvement of 5-14 shades on the VITA-scale. Providing our patients with information, taking their aesthetic expectations into account, and consideration of their individual needs, is part of our dentsits’ daily routine. An aesthetic dentition with beautiful teeth is essential for a good appearance. We restore decayed, broken or cracked teeth and solve other problems using state-of-the-art materials. These are a solutions for replacing missing teeth or restoring larger edentulous areas. The result is aesthetically pleasing, restores chewing capacity and sound formation. For achieving the perfect result we recommend metal-free zirconia-ceramic, pressed ceramic and porcelain restorative solutions. When there is extensive damage to the chewing teeth, we recommend inlays which are prepared by the dental technician. For the front teeth, we use ceramic veneers to restore damaged and discoloured teeth. Irregular dentition and crowded teeth are difficult to clean properly and can easily be prone to tooth decay and periodontal diseases. With orthodontic treatment, bite disorders can be corrected and regular dentition can be restored which beyond aesthetics, are significant for maintenence of oral hygiene. Orthodontic treatments can be performed from early childhood to adulthood depending on the disorder. In certain cases minor irregularities can be corrected with a removable dental brace. It is a painless, comfortable solution providing fast results. The device is entirely transparent, so there is no aesthetic disadvantage. We treat more severe irregularities as well with the intervention from our orthodontics specialist.